Wholesale Distributor of a wide range of products which include stereo bodypack receiver and headworn microphone. We are prominent enterprise actively involved in supplying and trading superb quality Stereo Bodypack Receiver. Our offered receivers are highly acclaimed for their compact design and matchless performance attributes. These receivers being procured from trusted vendors are fabricated by utilizing progressive technology and finest quality raw material. Apart from this, we supply our range of products to our customers at pocket-friendly rates. 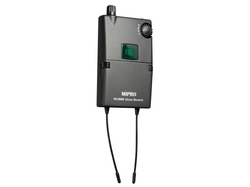 MI-808 is an IEM system designed for stage performance and broadcasting. Advanced dual-antenna true diversity technology eliminates signal dropouts and enhances signal stability. Our firm offers a high-quality range of Headworn Microphone. It is manufactured using top quality materials and latest technology and tested under various quality parameters. It should be installed to MTG-100T portable transmitter.